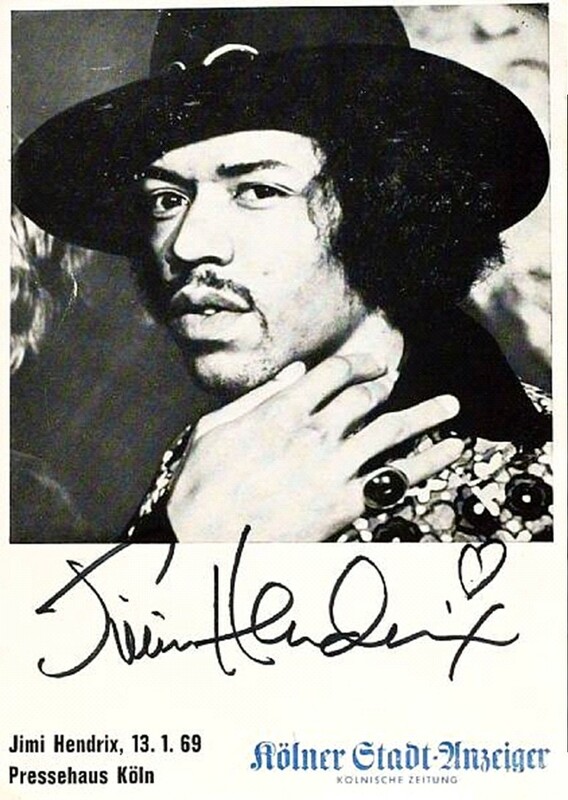 The justification for this signature study is to provide some sort of record for future generations so that they will have written reference to aid in the determination of genuine manuscript, or more specifically, genuine autographs that have been put on paper by the hand of Jimi Hendrix. There will be a lot of images used in this effort; the images that I am using are mostly those that I have gathered since the days that Windows 95 first appeared as an operating system. Many of these images were available earlier within various auction catalogs, very few were available prior to the mid 1980’s. 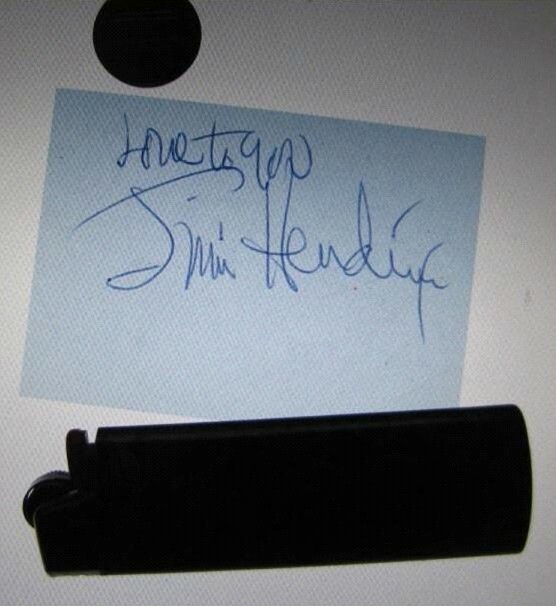 As of mid 2011 I have collected over 800 images of Jimi Hendrix autographs and full page examples of his handwriting. The wonderful book, “Cherokee Mist, The Lost Writings” compiled by Bill Nitopi, published in 1993, is an excellent visual resource that displays hundreds of pages of genuine Hendrix manuscript, documenting the creative process that Jimi seemed almost unable to turn off. 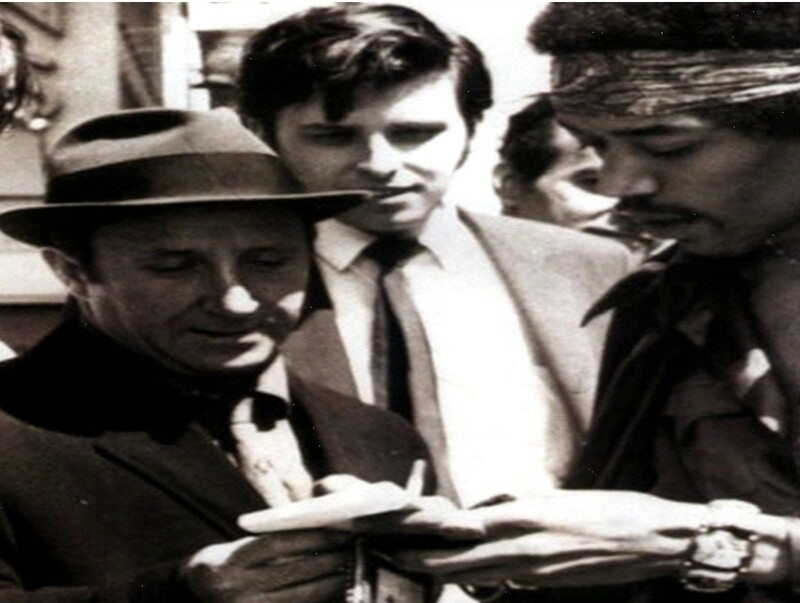 The primary intent of this endeavor is to focus mostly upon the signature of the 1960’s guitar genius, and to help the reader to be able to scrutinize an undocumented Hendrix autograph, hopefully, with keener awareness. 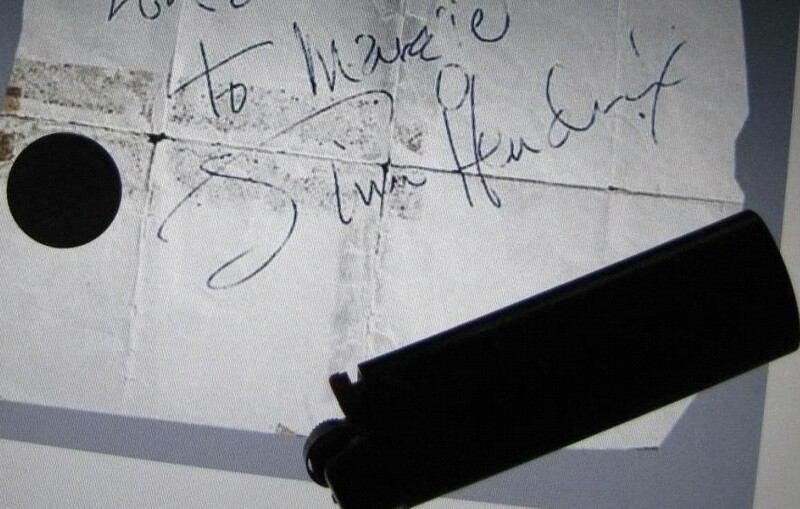 My search to understand what comprises an authentic Jimi Hendrix autograph evolved in its own way because of two factors. Firstly, like many others I wanted to own something tangible and real that had come from the hand of this extraordinarily cool individual. Many evenings I have stepped into Jimi’s world, transported by “Dragonfly” to various landscapes I sense are real and seem to originate from a universe that is “parallel to, yet quite different from our own”. My second reason for wanting to understand his signature was pride. I had read, and was undoubtedly convinced that there probably existed many forgeries of this signature available on the open market. I did not want to get “ripped off”. What is the point of owning a scrap of paper created by some guy, in his den, at his desk, in his underwear? Let us first begin with our exploration of Jimi’s signature by considering his artistic and improvisational nature. 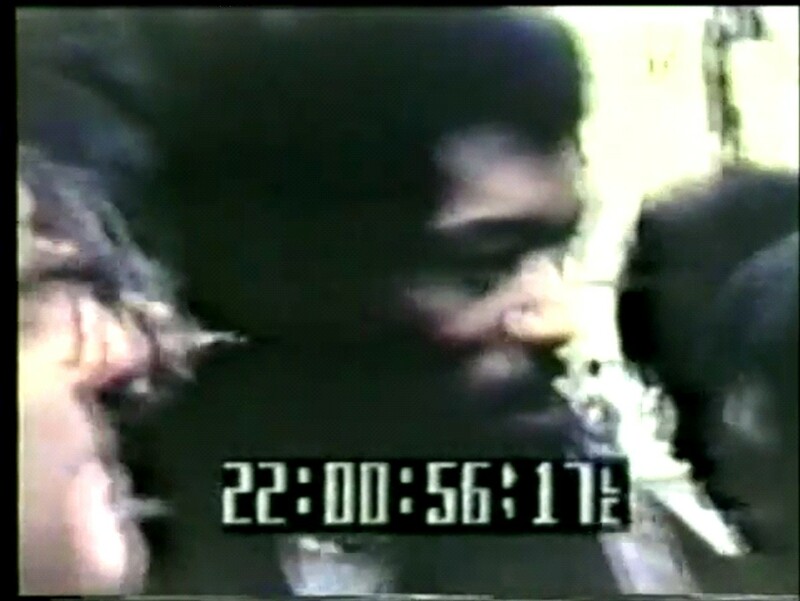 Everyone who knows Jimi, also knows that he played his guitar left-handed with strings reversed. Many are also are aware that he could pick up a standard right handed-rig and still, after moments, begin to separate the boys from the men. 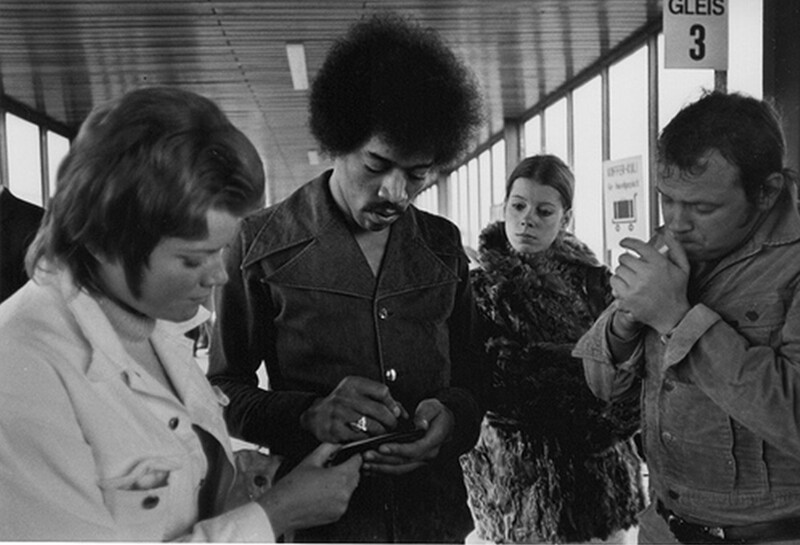 The fact is that Jimi was left-handed and that he was taught, as most were at the time, to write with his right hand. It soon becomes apparent from studying Jimi’s handwriting and signatures that he could be as creative and improvisational with his signature as he was with his music. It is also important to note the consistent height locations of the dotting of the “i’s”. The first dot is almost always higher than the second, and the third one tends to rest high, reaching upwards like the top of the “d” far away from the baseline. Now we compare what we have observed from one his best known signature to a lesser known genuine example. 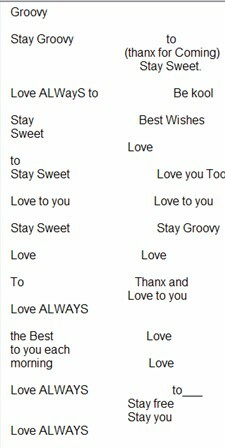 This “Two-Tiered” example demonstrates how Jimi, the signer, acted as a gravitational point for the letters within his name. 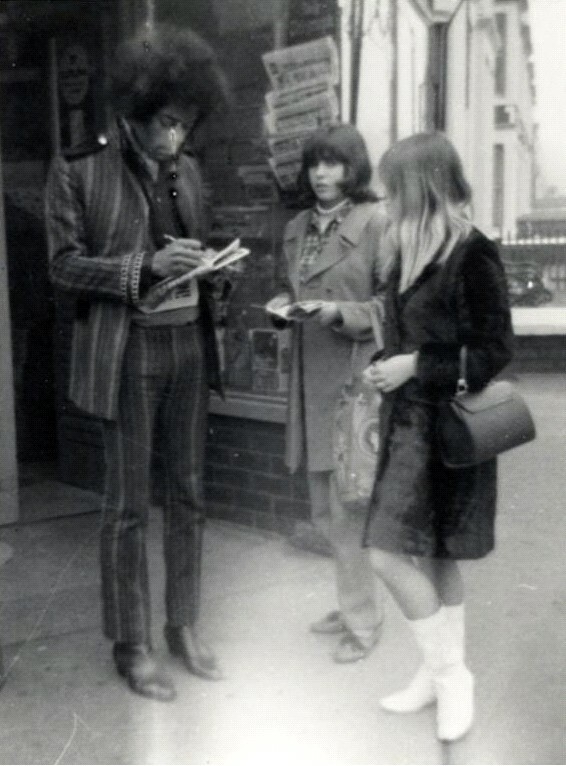 It is important to understand that no matter how rushed the signature, or how unusual was Jimi’s orientation to the paper he was signing, he would manage to consistently align and pull the strokes of the letters discussed in the same direction. 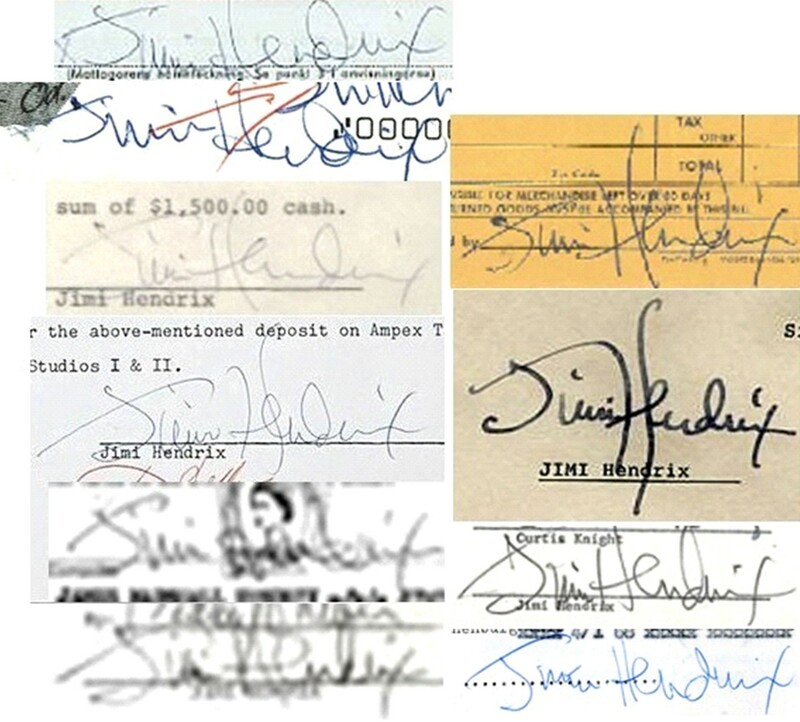 Shown here is a more extreme example of how Jimi would pull certain parts of the signature toward himself. It also gives one the understanding that a page presented for a signature is not always presented in a perfectly parallel manner. This is a receipt from Manny’s music store dated November 7th, 1969. 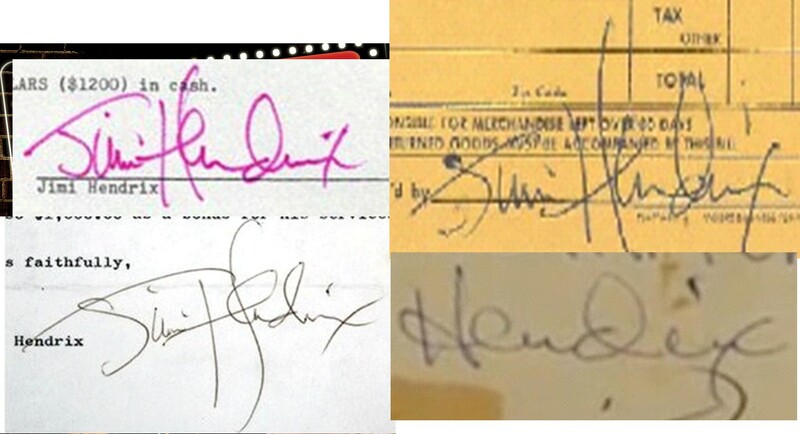 Another useful way to consider the autograph of Jimi Hendrix is to break it up and examine it as 4 distinct, separate parts. 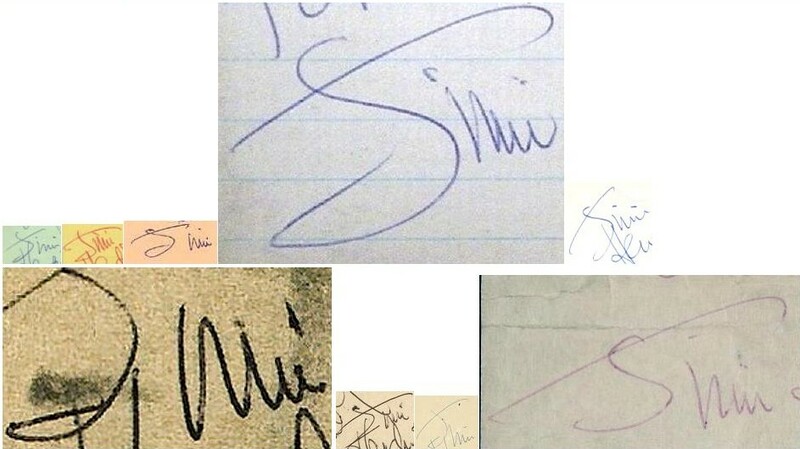 The signature can be viewed with an appreciation of the “J”, the “imi”, the “Hen”, and finally the “drix”. This dissection seems to lend itself toward an easier assimilation of what is genuine and correct about true examples. 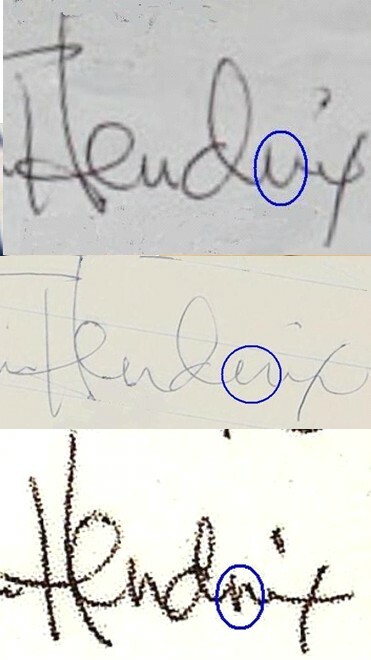 There are many well documented examples of Jimi’s signature. 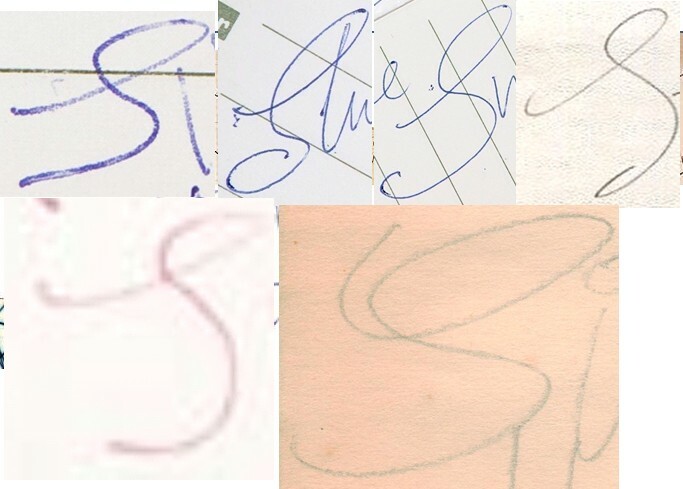 It is a good practice for someone concerned with autograph authenticity to spend as much time as possible studying only authentic examples of the signature that you are interested in. Leave the fakes, frauds, and questionable ones in a separate file until you have become VERY familiar with what can be considered typical. I have a small image folder of 75 exemplars that I am 100% sure are authentic. These are signed receipts, signed contracts, official documents, and fan collected items that are indisputable. I have hundreds of other autograph examples that I know are also genuine, yet do not come with 100% indisputable provenance. I keep these separate and judge their merit through comparison to those that are certain. 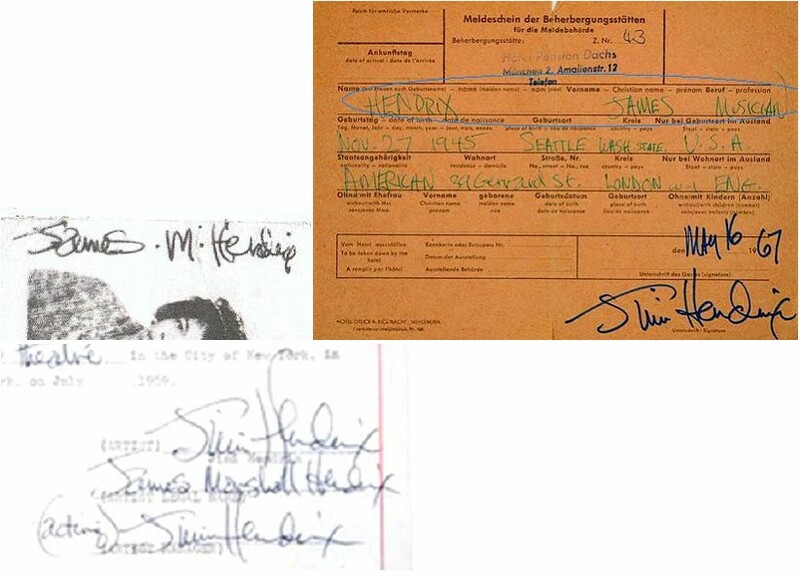 There are several documented signatures of Jimmy Hendrix as a teen and as a young adult prior to “Experience” fame. 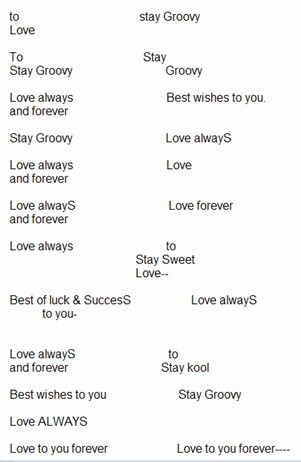 These are family letters, etc. “Museum pieces” and are almost never available for purchase. These early examples are great for getting an idea of the unconscious idiosyncrasies that Jimi had developed regarding his signature. 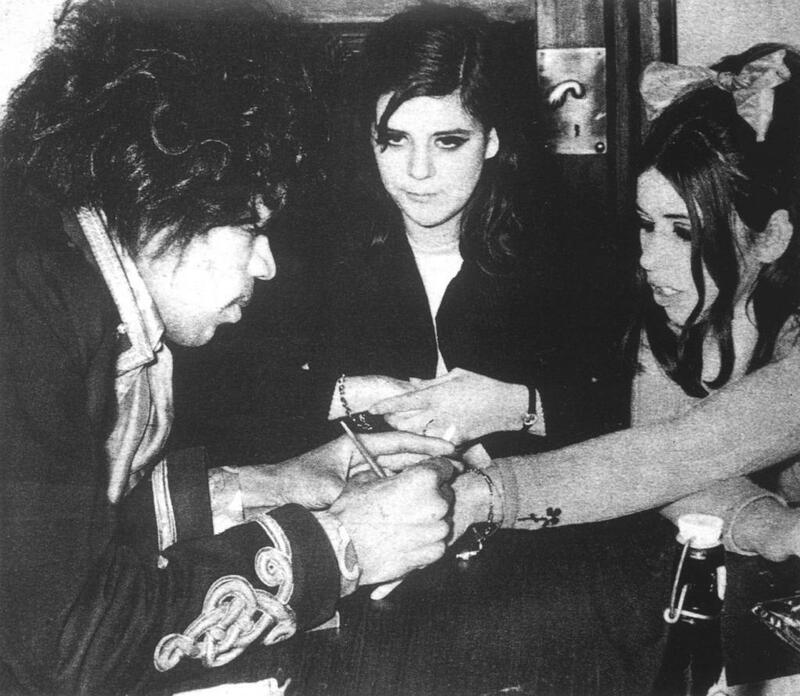 Remember that he only signed as “Jimi” for the final four years of his life. , one common version (shown here) is identifiable by the gap between the first “i” and the following “m”, (green arrows). 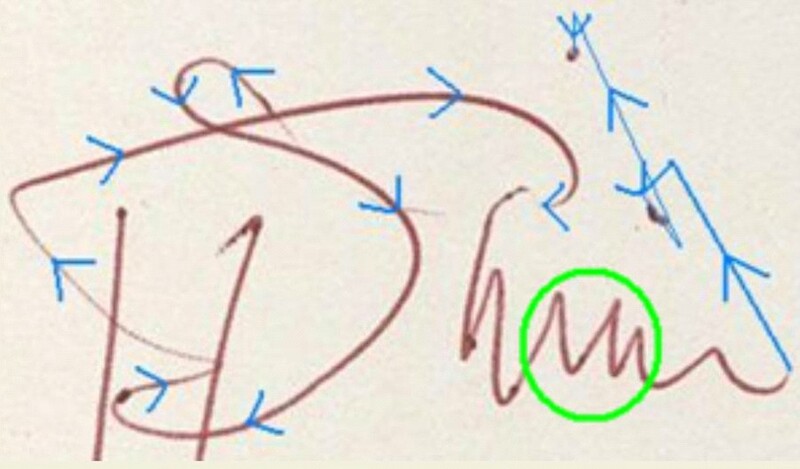 It is always good to be able to pick the “m” out of his signature, (red circles). 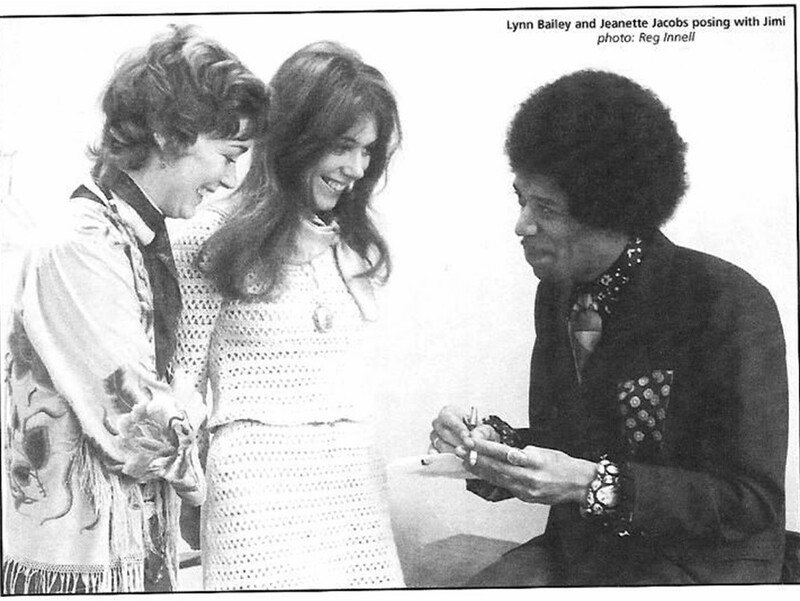 The word “mountain” shown here in Jimi’s hand is a nice example. 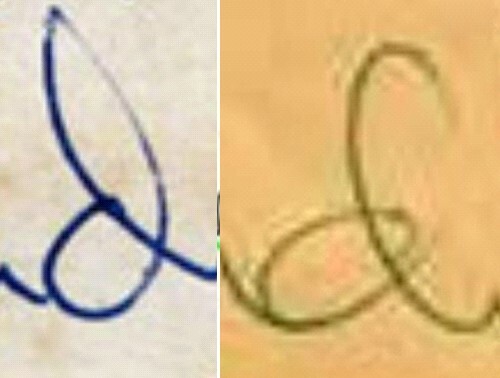 The “J” of Jimi’s signature almost always likes to lean forward. The crossing stroke usually loops back and will often point back toward the middle of the “imi”. Something else I’ve noticed about this “Wuu” style signature is that the “W” portion usually leans slightly to the right, and the “uu” portion leans a bit toward the left. 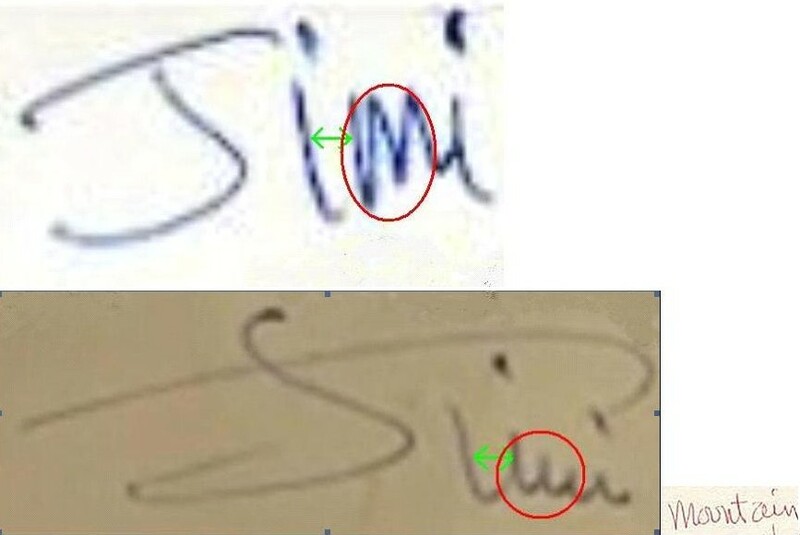 It is of interest to note here that as the crossbar of the “J” with its reversed 45 degree down stroke you can see how it loops back up and creates a very often seen upward “hook” (circled in blue) that begins the “imi” portion. 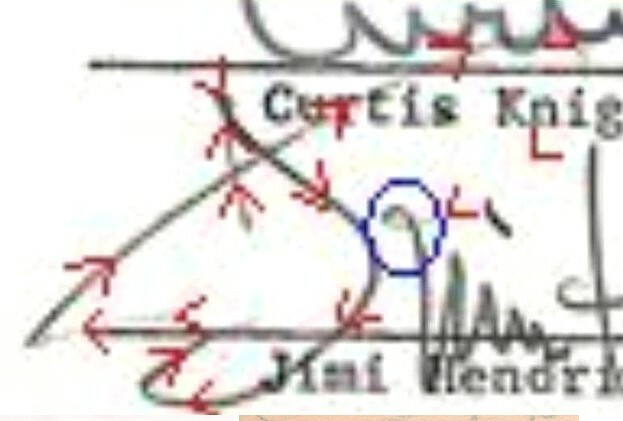 Here is signature diagramed to show flow for the “Jimi” portion of Jimi’s signature. Often the dotting of the “i’s” would create a “crescent”, semi-oval shape. Rembrandt, Beethoven, Picasso, and Hendrix. A single name is all that is needed to evoke an image of the artist. 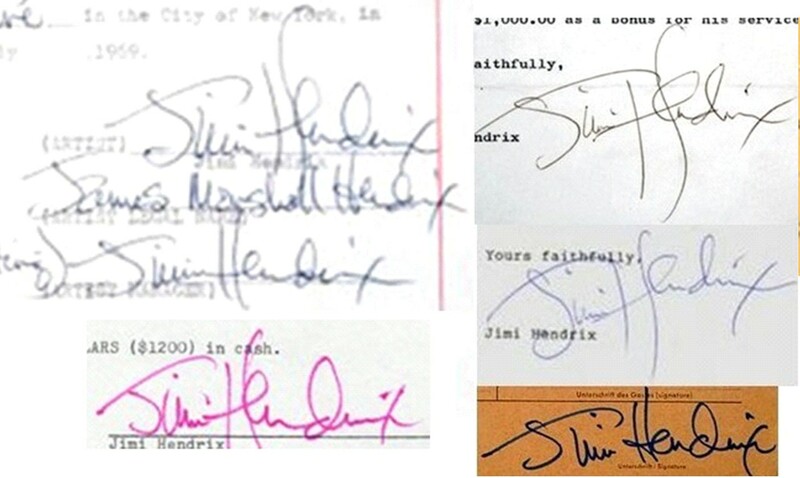 The “Hendrix” half of his signature often displays varied characteristics. The “H”, “d”, and “x” are the most consistent, while the “en”, and “ri” often are written 2 or mor differing ways. The 2 vertical strokes of the letter “H” almost always extends significantly below the baseline of the remaining part of the signature. In fact the concluding portion of the signature tends to follow the baseline quite nicely with only a slight dip with the letter “d” noticed. 75% of the time the second vertical stroke will arc toward the right at both top and bottom like an elongated Parenthesis symbol “(“. This vertical stroke is also almost always longer, at top and bottom, than the first vertical stroke of the letter. 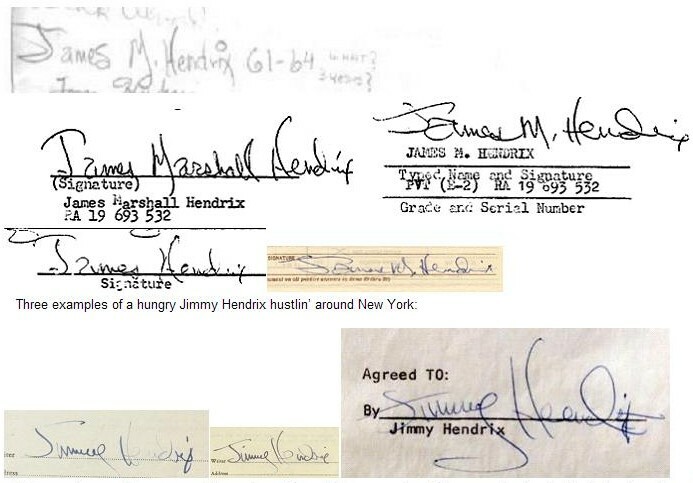 It appears that when Jimi signed contracts and his signature was forced to conform to an official horizontal line, that the second vertical stroke in his “H’s” would often become even longer and would appear as an elongated “S”. 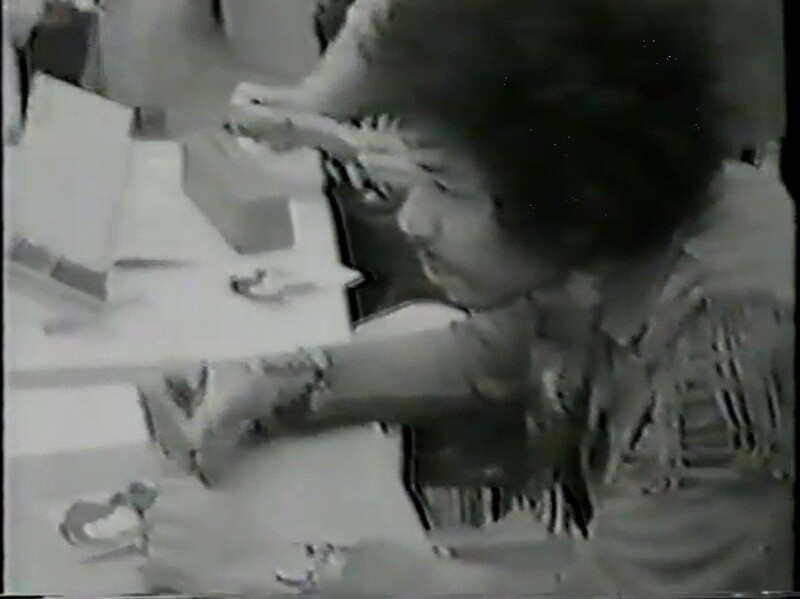 The “e’s’ within a Hendrix are often times the most difficult aspect of the signature for forgery artists to get right, and for this reason it is important to familiarize oneself with correct placement and formation. 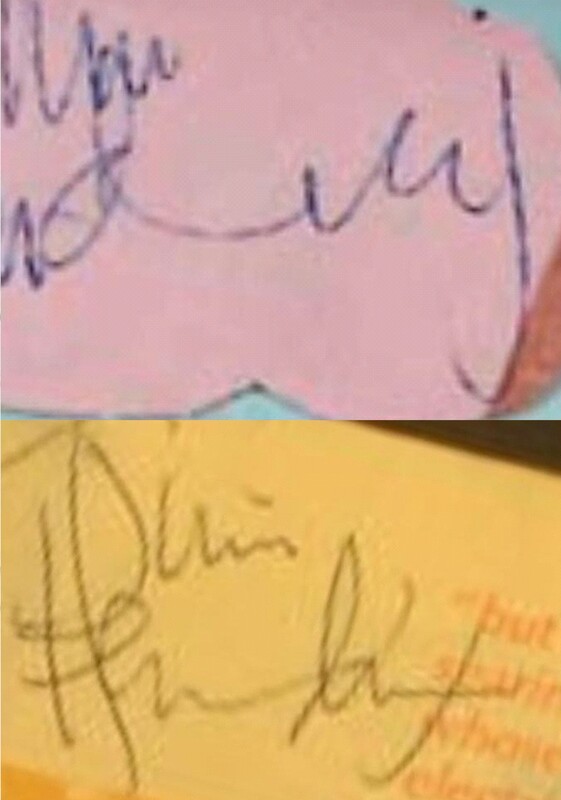 Perhaps only 15% or less of his “e’s” actually hug this closely to the “H” still it is well to be aware of how close those 2 letters are likely to be within a genuine signature. 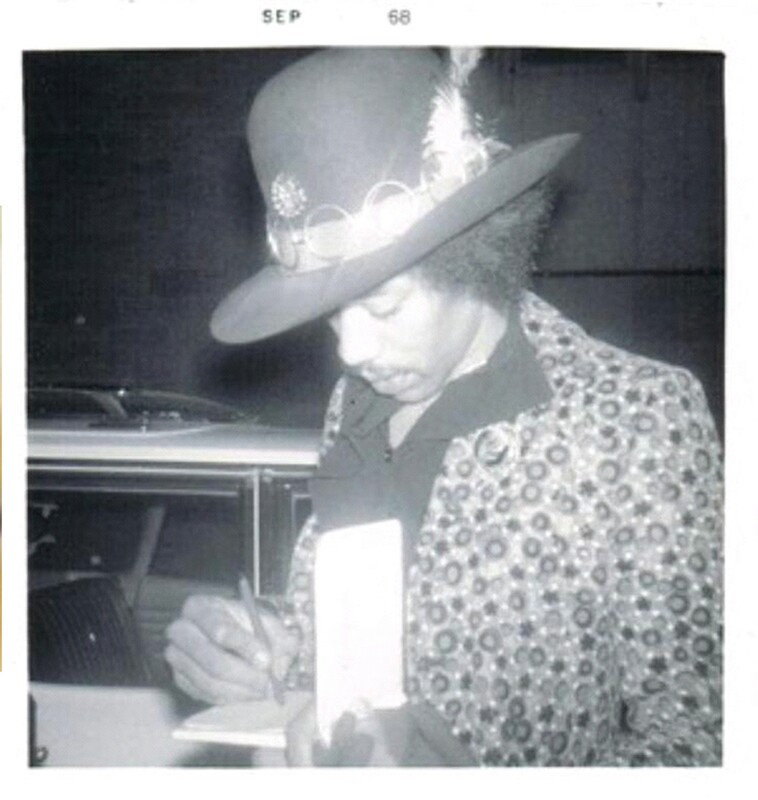 There are 2 common types of “e’s” that are found in Hendrix signatures. The first and most common. In the following examples notice how the mid-arm cross stroke of the letter “H” begins the formation of the “e” by forming a tilted, slightly right leaning, upside-down triangular teardrop shape. Many Hendrix “e’s” will begin this way and it is well worth studying. 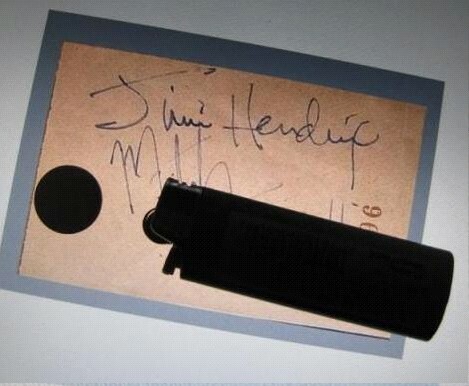 Anyone considering authenticating Hendrix signatures should study numerous good exemplars and recognize an authentic “e”. These less angular loop type “e’s” point more upward than the triangular version described earlier. 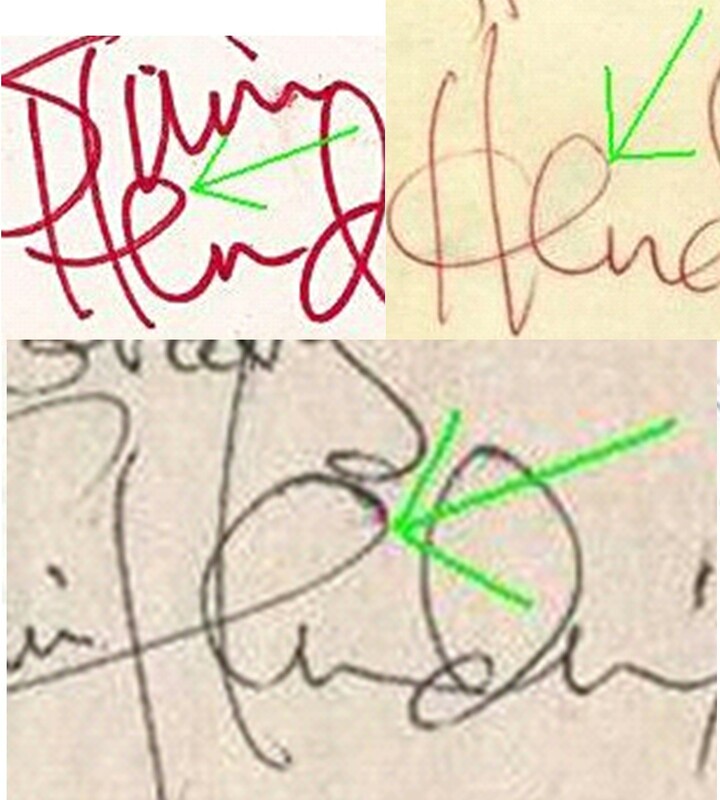 The lower connecting loop from the end of the “e” into the beginning of the “n” is followed by the formation of a horizontal stroke that is VERY consistently placed at the same precise angle when comparing just about any grouping of Hendrix autographs. The entire letter “n” is formed, obviously, with very determined, subconsciously memorized strokes. The beginning of Jimi’s “n” was usually created with a bold, forceful horizontal line, it would then ease its way into a shorter, softer pyramid. Very often the apex of this pyramid would display hints of, or a very obvious softly curved peak. The final curved upward stroke of the “n” would just about always curve upwards and become encircled by the lower half of the “d” . Roughly 60 percent of the time there will be a visible connecting stroke between the “n” and “d” leaving 40% of signatures lacking the visible connecting stroke. 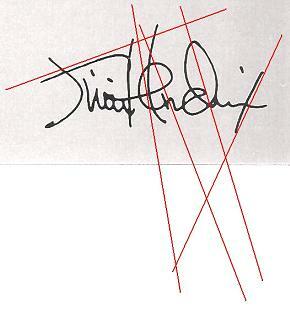 Earlier I stated that Jimi’s signature could be divided and understood as 4 separate parts, the final segment being the “drix” portion. 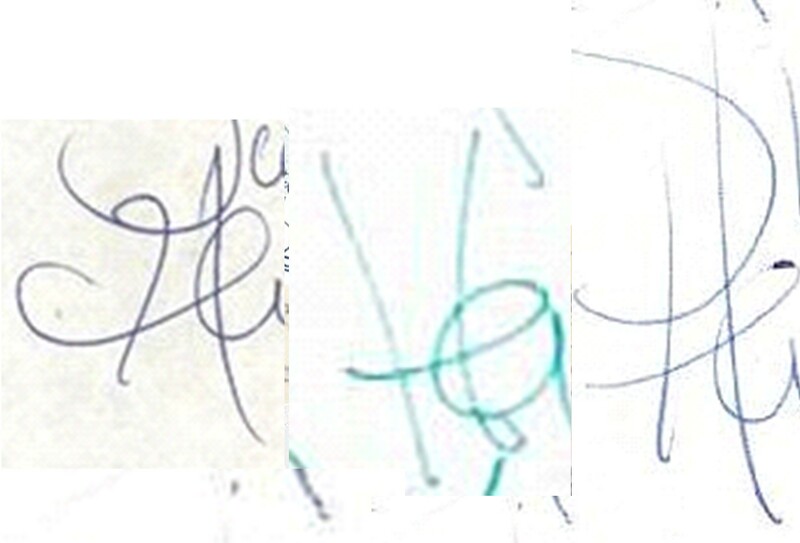 In the vast majority of his signatures there occurs a brief lifting of the pen between the completion of the “n”, and the beginning of the “d”. 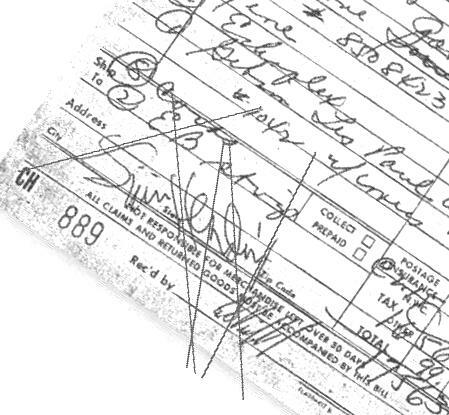 This final segment of his signature sometimes could be a bit hastily drawn. 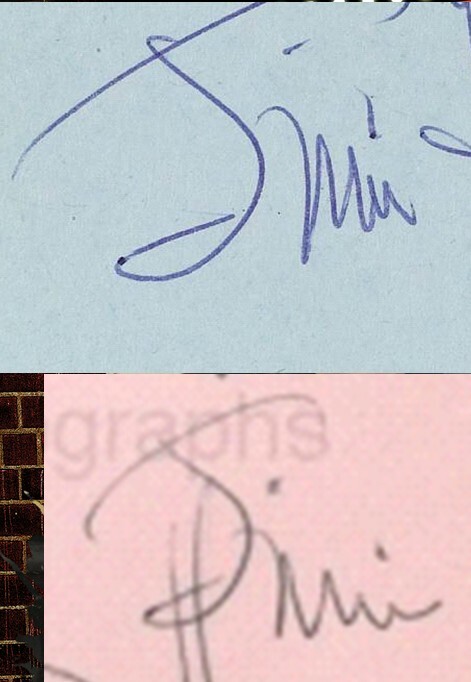 It was touched upon earlier how the “d” of Jimi’s signature very often shows some sign of reaching below baseline when compared with the rest of the surname. The lower half loop of the “d” was usually formed as a nicely symmetrical oval, leaning toward the right. The elongated upper loop would usually have a bit of a point at it’s apex yet about 10% of the time it can be rather rounded. 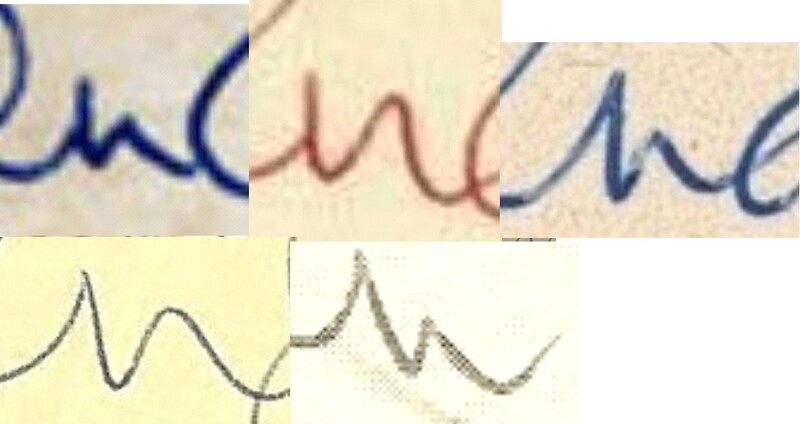 Very often the first upward vertical stroke that forms the top loop of the “d” is created with very light pen pressure (you may need magnification to see the variance), then the downward stroke follows with very deliberate pressure: Pen pressure and the fluidity of the entire signature can assist in weeding out traced, and slowly crafted forgeries. 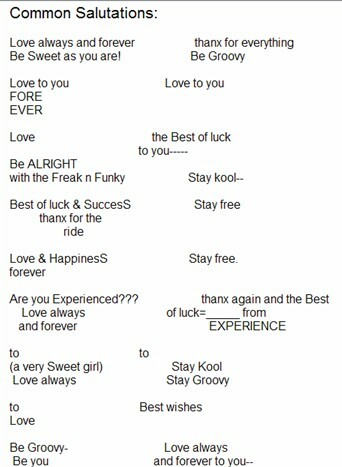 Jimi’s signature was, with very few exceptions, always unhesitatingly written. 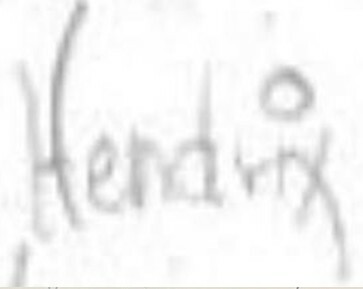 The “i” in Hendrix can be a useful indicator of a genuine signature, especially the dotting of that “i” The placing of that dot very often reaches almost to the same height as the apex of the “d”. 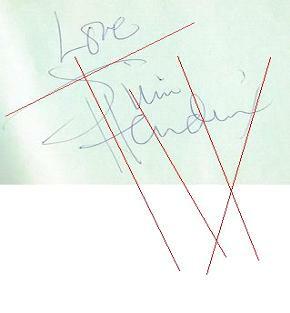 The final crossing of the “x” in a Hendrix signature is very consistent. It is almost always created by a downward stroke at a consistent angle, (very consistent when compared to the angles of the vertical lines in the “H”). The “x” usually will display a slight clockwise curve toward the very end. 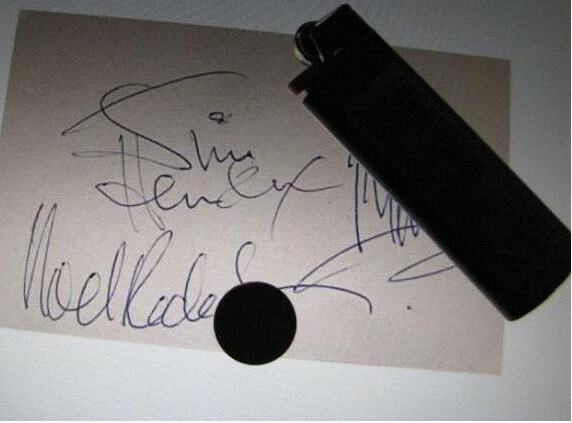 Just what size can you expect a Jimi Hendrix autograph to be? Extraordinaire work ! Congratulations ! Great ! 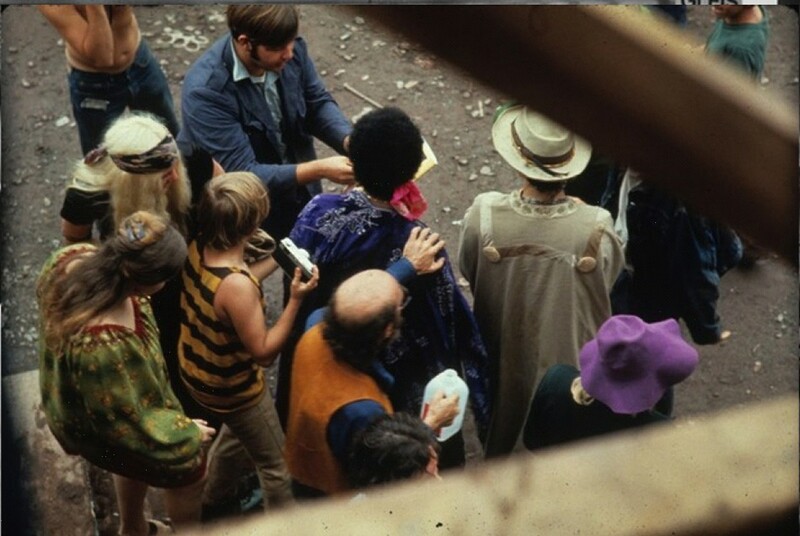 Do you know the Experience autographs from october 14, 1966 ?? If not, I’d like to send it to you. Yes. I thought your name was familiar! johnny hallyday L.P.? I would have been very very surprised if you never heard about that Johnny Hallyday E.P. !! 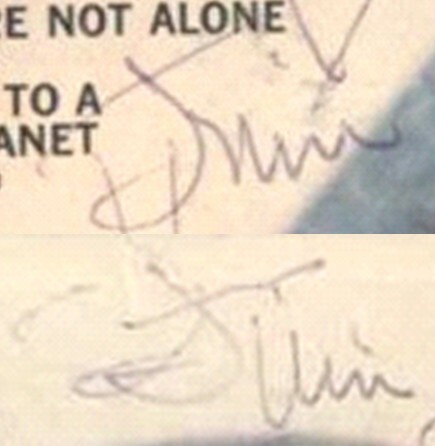 Some people though Jimi signature was fake (made later !!) but I’m 150% it’s him of course. 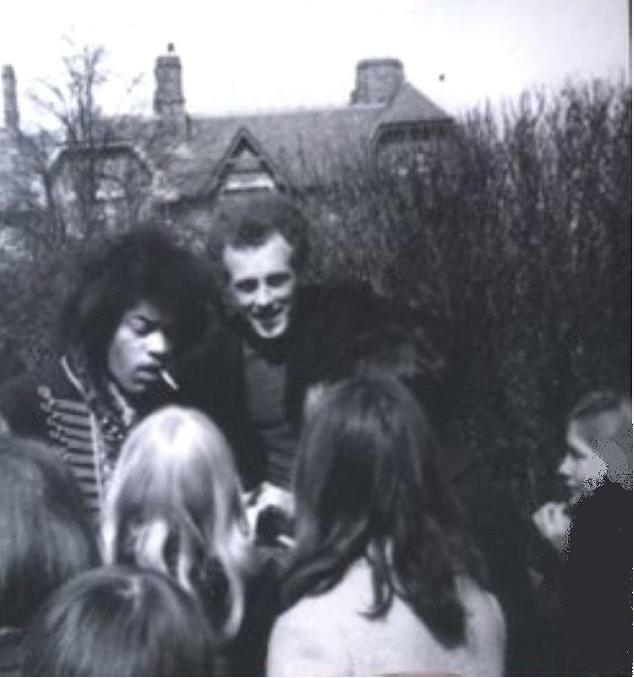 I do think it may be the really first known Experience autographs. What do you think ? 100% genuine! Could be the earliest Exp. signed item. Who thinks it is not genuine?